This gorgeous prototype of the Karas Kustoms RETRAKT pen was sent over by Dan for me to examine and try out prior to the launch of the Kickstarter funding. I already have a Render K in aluminum and I love it - it's a very cool piece and it stays with me almost always, so I was pretty eager to give this one a go. This new pen is a “click” style pen that uses a near-silent mechanism to expose and retract the tip of the refill in use. The RETRAKT features a German-made, all metal, knock mechanism, the signature heavy duty stainless clip, and will come in three different materials. With the Render K aluminum machined pen. In addition to aluminum and brass, Karas Kustoms are introducing a version in copper. The aluminum version will be anodized and the copper and brass versions will be hand-finished and left raw. The copper RETRAKT is very, very cool. I have taken it apart, observed it, written with it, and taken pictures of it. It's really just gorgeous. It's a warm copper with that knurled top that I'm crazy about. Nice, snug clip that won't snap off. Pure goodness. Each RETRAKT is ready to accept the Pilot G2 refill, just use the provided spring, and you're ready to go. If you want to run a Parker compatible refill instead, just drop the provided machined spacer into the upper half of the barrel (the part with the clip) and assemble as usual. Now you can easily find a refill at any office supply store if you run out of your favorite ink and can't wait. I'm surprised at how comfortable it is to write with, given its weight. Well done on that one. The combination of the gel ink refill with the weight of the pen came together very well - the pen's weight puts the pressure on the gel's tip which requires almost no effort on the user's part to get the pen to write. Very cool. And not something I was expecting either. Have a look at the other pens by Karas Kustoms - there's a delicious selection. Check out the Kickstarter project! Pledges start at $30.00USD. Looks great! Do you know if a HiTec C or Zebra Sarasa clip refill will fit in this pen? Nice review.. I missed the first backing group ...it seems it sold out in an hour. I wish the kickstarter page and this review had more details.. the pen utilizes both G2 and Parker refills; how does the tip/nose account for the difference in refill point diameters? Does either refill rattle/move around at the tip? It seems each refill must extend/retract only a little bit as anymore and the G2 refill plastic would jam in the tip hole? Really a versatile setup being able to take two completely different types of refills. 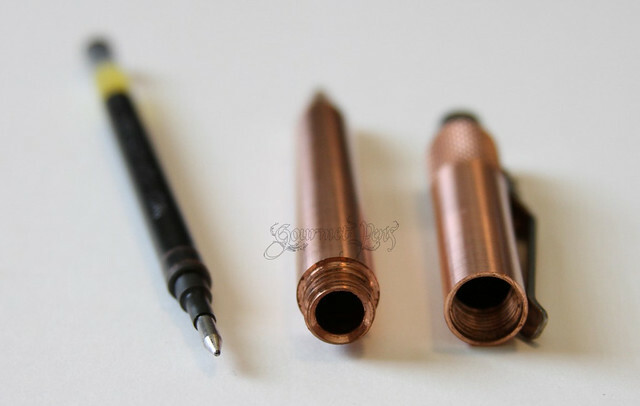 Neither refill rattles around in the copper body, even during writing. The copper body is a lot heavier than the aluminum and brass though so I cannot speak for the other two. If there is rattling in the lighter aluminum, it may be more noticeable. They provide a spring and spacer for the Parker refills to accommodate for the size difference. Hi-Tec-C doesn't fit. The Zebras probably could fit with a little bit of hacking - clipping off the end and figuring out whether you need the spring/spacer. I didn't want to cut my refill because it goes in my Zebra pen but it most likely could be done. They're meant to use Parker and Pilot refills though. Thanks..these folks are certainly getting closer to the ideal pen.